Help Documents - Version 5 Add Sessions (Workshops, Breakouts)How to scan Session Attendees online? This option requires a computer with a USB cable connected to a scan gun located near the session entrance. As attendees enter, their barcode is scanned and they are marked attended immediately. Setting up to scan online. 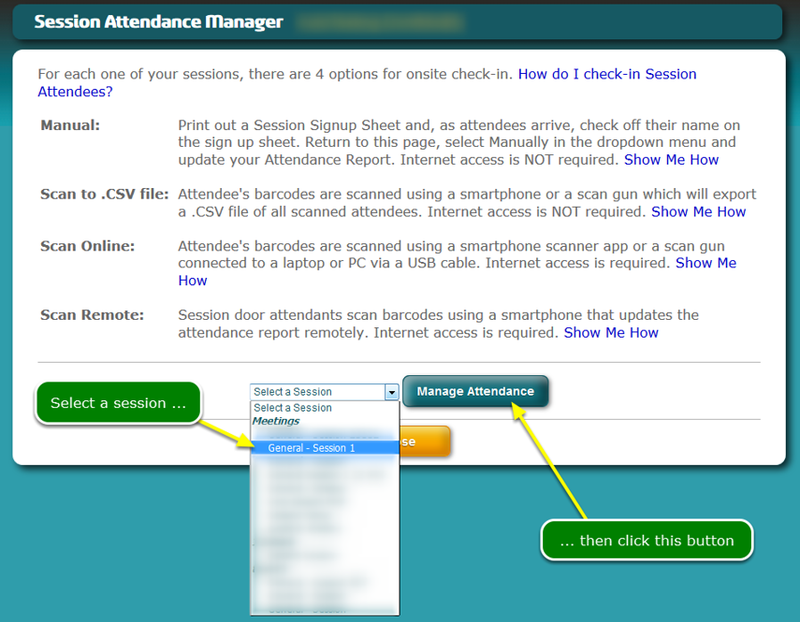 On the computer, login to your Admin Dashboard and open the Session Attendance Manager screen. Where is the Session Attendance Manager? Select the session for which you want to mark attendees Attended from the dropdown menu. The Attendance Report can be viewed. Select the Scan Online option. Aim your scan gun at a barcode and pull the trigger. The registrant's ID will be sent to this screen's capture field and automatically submitted. You will see this screen on a successful scan. Your scan gun will automatically reset in preparation for your next barcode scan. Zoom: You will see this screen on a successful scan. You will see this screen when all session attendees have been checked in. When you see this message, you are finished scanning for this session. Logout of your dashboard and secure the computer. 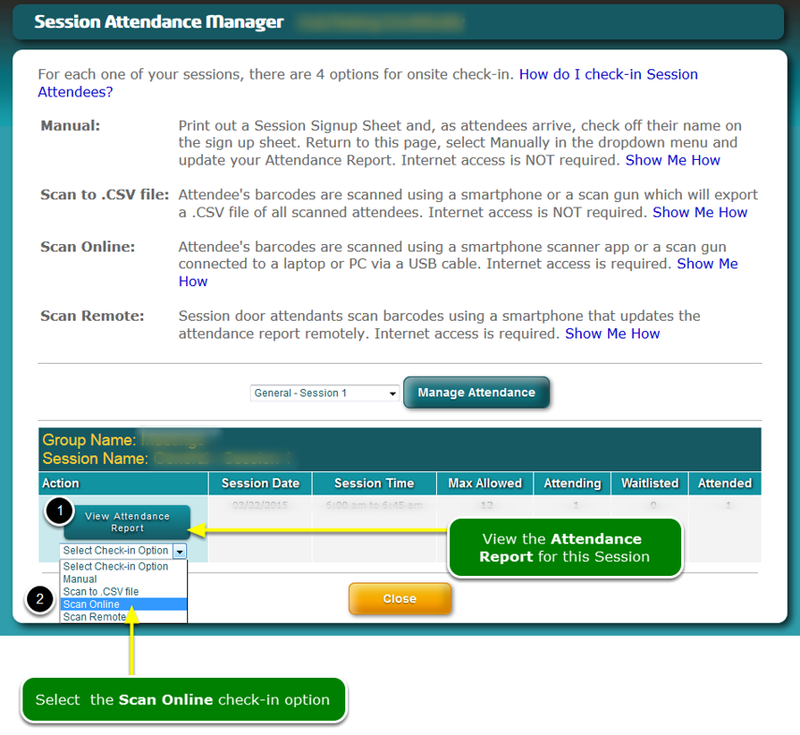 Zoom: You will see this screen when all session attendees have been checked in. You will see this screen if an attendee has already checked in. Zoom: You will see this screen if an attendee has already checked in. You will see this screen if an attendee is not signed up for this session. Zoom: You will see this screen if an attendee is not signed up for this session. What if my scan gun fails to send a registrant ID? If your scan gun fails to scan, you can read the number beneath the barcode and type it into the Registrant ID field. Then click the Check In button. Zoom: What if my scan gun fails to send a registrant ID? This screen represents a successful scan by typing the Registrant ID into the capture field and clicking the Check In button. Zoom: This screen represents a successful scan by typing the Registrant ID into the capture field and clicking the Check In button.